1882: Semi-bituminous coal began being mined in Pocahontas, Virginia, only a stone’s-throw away from Bramwell, West Virginia. This brought thousands of laborers, mostly immigrants, to work in harsh conditions all for the promise of a better life. 1883: Joseph H. Bramwell, a fortune seeker and a New York civil engineer, arrived to Bramwell later becoming the first post master. He said "Every little baby has a name, and this little town must have the same. I therefore name it Bramwell." Later in his life, Joseph also became President of the infamous Bank of Bramwell. 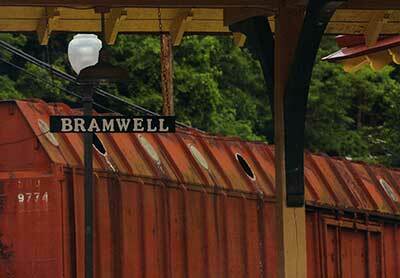 1884: The first rail system was in place in Bramwell allowing the coal being mined to be shipped out. 1884: The first coal mine on the West Virginia side of the Flat-Top Coalfield was opened by John Cooper. 1885: Bramwell was settled by the Flat Top Coal Land Association, the largest holder of coal lands in Southern West Virginia. 1886: Several large hotels were built throughout the coalfields by Norfolk & Western Railroad. The Bluestone Inn was built in Bramwell and was a favorite spot for social activities. This building survived the fire of 1910 but closed shortly after the Great Depression. 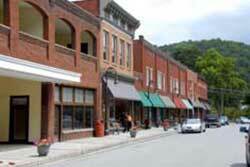 1888: The Town of Bramwell was founded. 1889: The Bank of Bramwell, supposedly one of the richest banks in America, was chartered. 1890: I.T. Mann moved to Bramwell. Mann lived in Bramwell with his wife and 2 children for about 20 years. He was one of the most powerful men in the coalfields and was associated with the Bank of Bramwell. It is said that by the late 1920’s, Mann was worth $89 million dollars. 1890: The Bramwell Presbyterian Church was organized by I.T. Mann. The church was constructed of local bluestone and finished construction in 1903. The first service was held in 1904 and to this day, the church is used for services every Sunday. 1893: The Bank of Bramwell was built. It reportedly financed several projects outside of the town including the Burning Tree Country Club in Washington, DC. 1893: The Bramwell Masonic Lodge No. 45 A.F. & A.M. received an official home as the Masonic Temple was constructed. Several offices, including Pocahontas Company, were housed in the building. 1895: Phillip Goodwill, general manager of Goodwill Coal & Coke Company, built a classic Victorian home on a hill overlooking the Bluestone River. This home, 10 years later, was remodeled to include a ballroom on the third floor for his beloved wife, Phoebe. Phillip later became the President of the Pocahontas Company. 1895: Edward S. Baker moved to Bramwell becoming the first principal of Bramwell High School. He was employed by the Bank of Bramwell, and smart investments made him a millionaire. 1896: Jairus Collins arrived in Bramwell as general manager for Louisville C&C and helped organize the Pocahontas Operator’s Association. He reportedly acquired properties for investments and several coal operations. Even today, on Main Street, a portion of businesses still remain in the original “Collins” building. 1899: John Cooper passes away as the President of the Bank of Bramwell. 1902: The Buckeye Coal & Coke built a home in Bramwell for their general superintendent, J.C. Pack. 1902: The Bank of Bramwell built a home for J.B. Perry and his family. Perry was one of the bank’s first cashiers. This house’s large front porch makes it inviting. Fittingly, the house served as a Bed & Breakfast for many years. 1909: W.H. Thomas and his wife, Annie, began building their Revival Tudor style house in Bramwell. It took 3 years to complete the house and cost as much $95,000 at the time of construction. Italian stone masons constructed the stonework of the house and retaining wall with stone quarried on the property. 1910: A fire broke out in a pool room on Main Street, completely destroying 21 buildings. Reconstruction then began quickly and several businesses have since opened! 1910: The Bryant Pharmacy opened right before Christmas. Ladies lined up to buy Chanel #5 Perfume. This pharmacy was the 3rd in the nation to stock this item. 1910: Edward Cooper Sr. built his stately mansion bearing the first copper roof in the United States. Its golden bricks were hand-fired in Europe. A few feet away from the main house, sits a building housing an indoor swimming pool that is still functional. Original descendents of Edward Cooper still inhabit the house. 1914: Colonel John D. Hewitt, Sr. built his mansion in 1914. Hewitt was the first mayor of Bramwell. The home was built to reflect Katherine’s, John’s wife’s love of cottages. She requested an “Anne Hathaway Cottage.” The property includes a guest house/carriage house and keeps up with the tradition of Bramwell luxury. The Hewitt House was the last mansion constructed by a coal baron. After John’s death, Katherine managed the coal mine, an unheard of situation in the gilded age.